What’s the best battery powered snow blower? We’ll give you the full tour, but first, a little backstory. One of the daunting tasks of winter is having to clear through the snow, especially when it has to be done on a daily basis. If you live in a region that stays cool even during the typical ‘summer’ months then you know what I’m talking about. A snow blower can be very advantageous to get the job done. There are different types to choose from and they range in power from an electric snow blower to a battery powered snow blower, so it’s wise to get to know a little bit about them before venturing out to buy one. A snow blower puts far less strain on your body and heart. Let’s face it, shoveling snow is no walk in the park. It can be very hard on your back and knees from the physical exertion that manual shoveling puts on the body. It also puts a strain on the heart and can lead to heart attack, which makes up for approximately 7% of snow-shoveling related injuries and ALL snow-shoveling related deaths. If you are over the age 55, you risk a greater chance of having heart-related problems while shoveling snow. It’s also rather time consuming. Apart from inconvenience, this can be a major factor to consider when temperatures are dangerously freezing outside. The physical effort of shoveling snow can be dangerous to your health, not only from the exertion it puts on the muscles, but also leaving you exposed in the elements for a much longer period of time. Hospitals see an average of 11,500 people per year from snow shoveling-related incidents! If you’re ready to hang up that snow shovel, here are some different types of snow blowers to consider. Maximum electric 15amp motor and wide 21″ clearance. Great for small yards. Electric snow blowers are ideal for the average snowfall that isn’t heavily packed and over 8 inches high. These are propelled by a rubber-lined auger that throws the snow to clear a path. Because the auger is so low to the ground, you wouldn’t want to use this on a gravel driveway as rocks can be sucked up and become hazardous projectiles! With electric blowers, you need an extension cord depending on the size of the driveway or length of the area you need to clear. For these, a heavy-gauge extension cord is strongly advisable that is at least 12-gauge or heavier, depending on the amperage of the snow blow blower and the length of the cord. Read our guide on Single Stage Snow Blowers to learn more. Designed for heavy snowfalls. Even has heated hand grips to keep you warm. Snow blowers that run on a gas-powered engine are typically much larger than their electric counterparts to take on serious snow-clearing jobs. There are multi-stage types of gas powered snow blowers with single stage being the smaller type. Dual stage blowers consist of an auger that doesn’t touch the ground so if you have a gravel driveway, these are more suitable. Gas-powered blowers are usually more efficient than electric, but keep in mind they require more space to store them during off-seasons. Dual-stage system driven by gas engine. There is also a 3-stage gas-powered line of snow blowers, but these are generally used for commercial use. They are monstrous in size with incredible clearing power. If you have more money than you know what to do with and looking to clear away over a foot of snow, be my guest. For the average Joe, a single or dual-stage unit will serve you just fine. These types of snow blowers, often referred to as cordless electric snow blowers, are battery operated. They’re single-stage units ideal for light duty to clear away snow on driveways and walkways. If you’re trying to compare the pros and cons between each of these types of snow blowers, you likely won’t find much on battery-powered models. That’s most likely due to the fact that they are somewhat new and still developing. That being said, I can definitely see a rising trend in these types among various brands once the technology breaks through with more improvements. The reason I say this is because battery operated snow blowers (or snow throwers) have a great deal of advantages. Obviously, they are powered by battery power so there’s no need for an extension cord or refueling and it doesn’t have to ‘prepped’ for summer as with a gas-powered. You might be thinking that a battery-powered model isn’t as powerful, but you would be surprised at what these machines are capable of. They can run just as efficiently, if not more, than electric-powered blowers and they’re much quieter so there’s no need for ear protection. They also take up less space to store them than most gas-powered models, leaving you more room in the garage for your other toys – er, I mean tools! The major downfall to these is that the battery does need to be recharged periodically. The duration the battery will last will depend on the amount of snow you’re trying to clear as well as the area you are clearing and size of the battery included with the unit. This can actually be a good thing, however, because it’s important that you don’t overexert your body in harsh climates. If you need to recharge the battery before the task is complete it may give you the break you need. Frequent storms to bring above-normal snowfall to northeastern US. Seeing that this is an El Niño year, and quite possibly one of the strongest in history according to the stats on the previous 60 years, it may be wise to plan now for unpredictable weather changes. Typically, a milder winter can be expected with an El Niño for those that live in the central states of the U.S.; although, the higher chance of precipitation could mean more thunderstorms and consequently result in more frequent snowfall. El Niños have been well known to cause major unpredictable weather patterns, so it’s always better to be prepared. If you live in a climate that is typically prone to snowfall during winter, chances are you don’t need convincing that a snow blower is ideal. There is no shortage of gas-powered models and electric models on the market, so check out these battery powered snow blowers that I would suggest. ✓ New for Winter 2016/2017 : First ever 2-stage battery powered snow blower! It’s hard to believe that this beast is powered by batteries. Welcome to the new age. Well, now more than ever technology has finally caught up with gas snow blowers because Snow Joe has engineered the first ever 2-stage snow blower powered entirely by batteries. It’s an impressive feat that benefits every consumer because now you have the choice to tackle heavy snowfalls without the need for gas snow blower. The Snow Joe iON24SB-XRP is quiet, maintenance free, lightweight and free of fumes. We’ve dedicated a full article to this special snow blower so if you want to know more then we recommend reading our in-depth review of the Snow Joe iON24SB-XRP. There are a lot of details that I’m sure you’ll appreciate. It’s not a cheap snow blower by any means but if you live in an area where you get a lot of snow year after year then I think it’s the best battery powered snow blower for the money. Snow Joe iON24SB-XRP : Includes two 40V 6.0 Ah batteries (& charger) which lasts 50 minutes of run-time. Snow Joe iON24SB-XR : Includes two 40V 5.0 Ah batteries (& charger) which lasts 40 minutes of run-time. Snow Joe iON24SB-CT : No batteries or charger. A good choice if you own other Snow Joe/sun Joe iON tools. Interchangeable batteries with iON power tools. Innovative battery-powered two-stage snow blower. Fantastic engineering. 80-Volt Max (2 x 40 V 6.0 Ah) EcoSharp rechargeable lithium-ion batteries provide up to 50 minutes* of whisper-quiet run-time and is compatible with all iON tools. Integrated push-button display: LEDs indicate direction and speed selection. Serrated steel auger moves up to 1000 lbs of snow per minute; cuts a path 24 in. wide by 13 in. deep without damaging surface. Dual 0.3 W LED headlights enables you to see in the dark; at night. TracAssist snow tires keep you moving in deep snow. Load sensing technology adjusts engine performance depending on demands. ETL approved; Full 2-year warranty; Includes 2 batteries + dual-port charger. View or download the MANUAL for the Snow Joe iON24SB-XRP. Discharge chute safety – Never direct the snow discharge chute at the operator, at bystanders, at vehicles, or at windows. The discharged snow, which may contain foreign objects accidentally picked up by the snow blower, can cause serious damage and personal injury. Do not use your hands to unclog the discharge chute. Stop the motor, remove the key and battery packs before removing debris. Please read the entire MANUAL when operating this or any other piece of power equipment. Safety should always be your number one concern. Don’t assume anything. Please be safe. The most powerful battery snow blower on the market. This bad boy is a workhorse for a battery-powered snow thrower. In fact, it is the most powerful tool of its kind that runs on battery-power. It operates on an 80V Lithium-Ion battery and delivers incredible efficiency. The brushless motor requires no maintenance and it’s whisper quiet when running. It can clear a 20” wide path and up to 10-inches of snow; however you could most likely clear greater depths with multiple passes. The battery has a 45-minute run time, which should give you more than enough run-time to clear a standard size 2-car driveway and sidewalk with a few inches of light snow. Plus, it recharges quickly in just 30 minutes. During the off-season, this model has an easy-fold system so it can be conveniently stored away or even provide compact transportation. Effective headlights for clearing snow at night. 80V Lithium-Ion battery powered snow blower. Up to 45 minutes of run-time. Includes a 2.0AH Battery. DigiPro digital controlled brushless motor. Higher torque & more efficient. Dual LED Lights enable you to see in the dark. Quickly folds up for easy storage or for transporting. Consider an extra battery for longer working time. If you buy the packaged GreenWorks 80V snow blower you get the 2Ah battery. If you want to vastly increase your snow clearing time you have the option to purchase a 4.0Ah battery, which is double the battery life. It takes one hour to charge instead of 30 minutes — and it’s expensive, but worth it if you need a longer working time frame. Save money when you buy the package. Includes battery & charger. Another option you can take is to buy the snow blower separately. If you take this route you’ll have to purchase the charger and the battery separately. But, instead of purchasing the 2.0Ah battery you can just buy the longer lasting 4.0Ah battery. In all honesty, this will be more costly as you save money when you buy the bundle. This makes sense if you already own other GreenWorks 80V tools. If so, the battery can be used across the entire tool series. You may surprised to learn that GreenWorks offers a 4 year warranty with their battery powered snow blower. This is longer than average and a sign that GreenWorks stands behind their products. Luckily, this snow blower is well-engineered but if something goes wrong it’s comforting to know that you’ll be covered. Great design backed by an impressive 4 year warranty. Overall, this is the top contender for the best battery powered snow blower. As far as power and clearing power — this is the snow blower to get. It’s a remarkable feat of engineering. You have to remember that moving snow requires a lot of energy and GreenWorks has pushed current battery technology to its limits. Maybe next year I’ll be talking about a 160-Volt battery powered snow blower. Who knows? But for the winter of 2015/2016, this is the snow blower to get. ✓View or download the MANUAL for the GreenWorks 80V snow blower. ✓Read our comprehensive review on the GreenWorks 80V battery powered snow blower. You’ll find that this is an easy product to assemble. You should be up and running in about 30 minutes. A great balance of price, affordability and quality. This is a really nice lightweight snow blower that is easy to push for clearing sidewalks, walkways, decks, and driveways. It’s a brushless snow blower with a rubber scraper bar to get right to the ground for clearing a path without damaging your deck. The unit only weighs 32 pounds, making it much easier to hoist up and clear paths faster. It’s powered by a 40 V 4.0 Ah lithium-ion rechargeable EcoSharp battery that runs up to 50 minutes at a time. The auger contains two rubber blades that can push up to 8 inches of snow and clears a path 18” wide. Well-constructed and designed with useful features. Keep in mind that with wet, slushy snow it may take longer and more effort to clear through, BUT it’s much easier to maneuver than the corded model. The directional chute auto-rotates 180° to throw snow at up to 20 feet. Enough power for light-duty snow clearing. 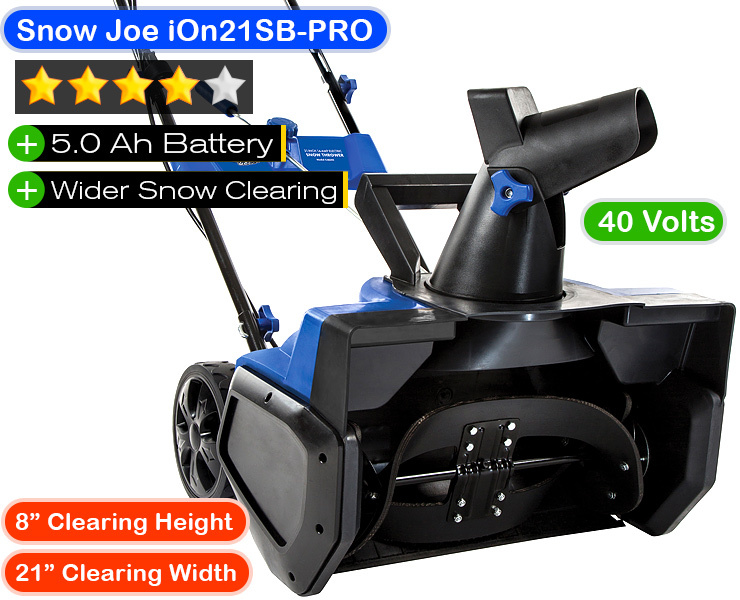 If you have a larger driveway/walkway, the Snow Joe iON21SB-PRO clears a path at 21” wide and has a slightly larger battery for longer run-time. There’s also an LED headlight equipped on the handle to give you better visibility on those dark, early mornings or if you’re clearing snow after dark! Video showing off the Snow Joe iON18SB battery powered snow blower. The Snow Joe iON18SB has proven itself to be a fantastic snow blower since it’s release. It’s powerful, reliable, efficient and easy to use. Customer satisfaction is high. This is a well-balanced battery powered snow blower that has a lot of great features while remaining relatively affordable — as far as battery powered snow blowers are concerned. Lightweight at only 32 lbs. Easy clear sidewalks, driveways and decks. 40 V 4.0 Ah EcoSharp rechargeable lithium-ion battery lasts up to 50 minutes. No maintenance or extensions cord to worry about. Steel auger with 2 rubber blades moves up to 500 lbs of snow per minute. Clears snow 18″ wide and 8″ deep. Won’t damage surfaces. 3 W LED headlight provides full visibility at night. ✓View or download the MANUAL for the Snow Joe iON18SB. ✓Read our in-depth review of the Snow Joe iON18SB battery powered snow blower. Ideal for large driveways and walkways. ✓View or download the MANUAL for the Snow Joe iON21SB-PRO. Lightweight design. Easy to maneuver. Weights only 36 lbs. Ideal for clearing large driveways and walkways. 40 V 5.0 Ah EcoSharp PRO rechargeable lithium-ion battery. Battery lasts up to 65 minutes. Compatible with all Snow Joe iON tools. Throws up to 660 lbs of snow per minute. Clearing width: 21-Inches. Clearing Depth: 8-Inches. 3 watt LED headlight provides increased visibility for nighttime snow removal. 600 Watt brushless motor. Greater battery efficiency, maximizes motor performance, decreases noise and vibration and extends motor life. Great for light-duty snow clearing. Don’t be fooled by the name of this machine; there is no back-breaking effort required with this snow shovel. While there’s no chute for it to throw the snow in a particular direction, it will clear a path and moves snow up to 25 feet. This bad boy is powerful and can push through up to 300 pounds of snow per minute according to the manufacturer! This battery powered snow shovel operates on a 40-V battery and the charger is included with purchase. It can run for up to 52 minutes on a single charge similar to the iON18SB model. It’s a little smaller in size at 13” so this would be most suitable for clearing paths on a sidewalk, patio, or clearing a deck. Not that you can’t clear a driveway with it, take a single-car driveway for instance, but it will take you a little longer to get the job done as opposed to a larger sized model with a wider sweep. Still, it’s cheaper and quite efficient if your budget won’t allow for the larger model and it could be great as a backup if you already own a snow blower. Comfortable grip and 40-Volt battery is easy to remove. What I particularly liked out of each of these battery operated snow blowers is the fact that they all feature a rubber or plastic blade auger. This is much safer to use on the surface of a wooden deck or patio so that it won’t mess it up. The downside to these, however, as I mentioned previously is that they are close to the ground so if you have a gravel driveway that you need to remove snow, better stick with a 2-stage gas unit. Could you imagine breaking a window (or worse!) from a flying rock? ✓View or download the MANUAL for the Snow Joe iON13SS. Designed for snow clearing on decks, steps, patios and sidewalks. 40V (4.0 Ah) EcoSharp rechargeable lithium-ion battery. Lasts up to 52 minutes. Super quiet operation. It won’t disturb your neighbors. No maintenance or tangled extension cords to worry about. 2-blade paddle auger. Throws snow up to 25 feet. Ergonomic, lightweight design with adjustable back-saving handle. Streamlined snow blower to get you through the winter. The RYOBI ZRRY40811 40V System is known today for superior power and performance. The newest addition to the 40V System maintains those standards. The RYOBI 40V 20” Snow Blower is equipped with a powerful brushless motor and Load Sensing Technology, providing consistent, quiet power that efficiently throws snow up to 25-feet. This Ryobi snow blower is a great package to consider. Sold with two high-capacity battery packs, this snow blower can clear driveways, sidewalks and decks for up to 40 minutes. With the 90 Minute quick charger included, additional run time is not out of reach if required. Works with all Ryobi 40V lithium-ion tools and batteries. Brushless motor maximizes battery life and overall efficiency. Load sensing technology automatically optimizes for the best performance. On-board LED headlights allows you to see at night. If after reading this article you realize that you’ll need more power for your snow clearing then read our comprehensive guide on two-stage snow blowers. If you live in an area where you expect to consistently get snowfalls over 8-inches then I suggest a gas-powered snow blower. Currently, battery or electric power cannot compete with gas. Maybe one day that will change, I’m sure it will eventually, but for now, the ultimate snow blower is driven by a gas engine. Although more people are treated for injuries acquired from shoveling snow, there is still a safety concern with using snow blowers. You should keep your health in mind before taking on the task, because even snow blowers can add undue stress on the body simply from pushing it. Another safety concern that lands thousands of snow blower consumers in the emergency room is, well, a lack of common sense really. Occasionally snow may freeze up or become packed or jammed in the unit and will require clearing so as not to damage the motor. Use a tool or even a broomstick for this. There’s a motor in there folks so unless you don’t really need your fingers, I strongly suggest to NOT stick your hand in the unit to clear a clog. Be realistic when shopping around by keeping in mind the size of the area you want to remove snow from and the typical amount of snowfall you get. Bigger is not always better. Having the wrong snow blower that doesn’t suit your needs could actually be worse in the long-run. You would be surprised how much more a smaller unit can clear as opposed to the bigger units that companies so often try to push you to buy. Clear the path before you begin. If you want to keep your unit performing at its best, be sure to look out for and pick up anything that may be in your clearing path such as kids’ toys or the morning newspaper. For this reason, snow blowers are equipped with shear pins that attach the auger to the shaft and are made to break off so as to prevent damage to the motor from items getting pulled in. It’s also a good idea to keep extra shear pins on hand for this very reason. Battery powered snow blowers require practically no maintenance in comparison to gas models; however, you should still clean it before storing it away for the summer. You may also want to be sure to tighten up any loose nuts and bolts on your machine periodically. I could go on and on about the benefits these cordless snow blowers have to offer, but just try one out and see that it speaks for itself. They’re generally more affordable than gas powered and a lot more convenient than having to drag around a heavy cord, which you have to purchase separately. Overall, you’ll be looking at saving money and hassle over time by going with a battery powered blower over the more traditional models.